(1) Saminathan Munisamy – An active social activist from Johor. As the founder and author of malayaganapathy.com website, he has done lots of researches about S. A. Ganapathy of which led him to be a popular resource person about the hero from the Indian community in our country. The title of the paper that he submitted for this forum is “S.A. Ganapathy: From a Social Reformist to Independence Fighter”. (2) C.C.Chin @ Chen Jian – Graduated from Nanyang University, is a historian of the Singapore and Malaysia left-wing movement. He has done a lot of research on the left-wing movement of Malaya and Singapore. 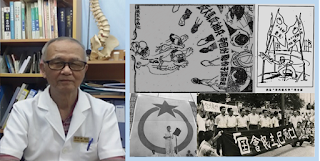 He has also involved in the editing and publishing work of a number of books about left-wing movement, among those are Dialogues with Chin Peng: New Light on the Malayan Communist Party (与陈平对话 - 马来亚共产党新解), Oral History of Eu Chooi Yip, a Singaporean Political Activist, on Political Development in Singapore from 1945 to 1965 (浪尖逐梦–余柱业口述历史档案), Historical Dialogue of Communism Movement in Sarawak (砂拉越共产主义运动历史对话), Pursuing Dream in Roaring Flames - A Journey of Revolution in Sarawak (烈焰中追梦–砂拉越革命的一段历程), Anti-Japanese Movement of the Chinese in Malaya (马来亚华人抗日运动), etc. 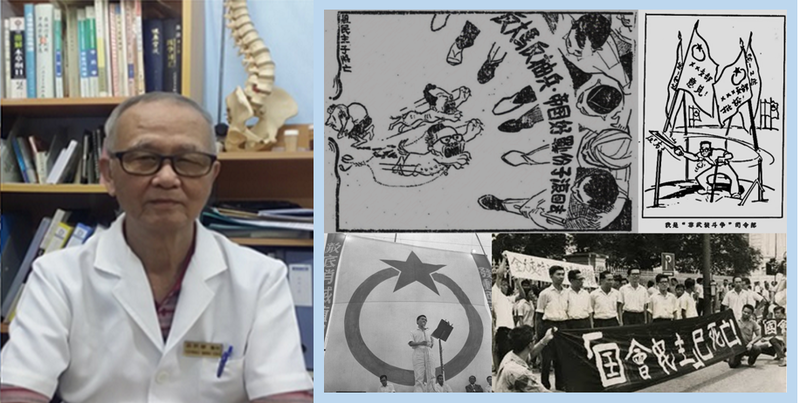 The title of the paper that he submitted for this forum is “The significance of inheriting and persisting Lim Chin Siong’s struggle line today” (继承与坚持林清祥路线的当前意义) [Note: The English title is temporary translated by Sahabat Rakyat from the Chinese language]. Another invited speaker, S. Arutchelvan, Secretariat of Left Coalition of Malaysia and former Secretary General of PSM is unable to make it to the forum as the date clashes with a pre-scheduled program in Kuala Lumpur. However, the organising committee is still trying our best to convince him to provide a paper for this forum and squeeze a little time to attend the forum. Besides, the organising committee deeply regrets that due to an unanticipated emergency, P. Waytha Moorthy, Chairman of HINDRAF, one of the co-organisers of this forum has to travel abroad and unable to attend the forum. We are also trying our best to convince him to provide a paper for the forum. Poh Soo Kai and Dominic Puthucheary had declined our invitation via email on 10 March separately. Panel speakers of this forum are given the choice to deliver their speeches in English or Chinese (moderator of the forum will convey key points in Chinese language). We will allow ample time for panel speakers to answer questions from the audience in Q&A session. Will the views to be put forward by panel speakers in the forum render some help to the democrats in our country to: ponder over the changing situation of political power that is currently in the phase of fragmentation and reorganization; seek for a democratic reformation programme that serves the interest and aspiration of the people in large? It will be something which many democrats in the country will eagerly want to know more about and sincerely anticipate for. This will be a forum of great significance which has drawn a lot of attention. So do not miss it. The organising committee particularly opted a suitable and comfortable venue for the forum that is convenient to NGO leaders and activists in Singapore and Johore who are keen in democratic movement to participate in the sharing face-to-face. As usual practice, we have requested panel speakers to submit their papers (no limit on numbers of words). We will compile their papers into booklet, which will be made available to all participants. We will also forward the papers to democratic parties, organisations and media, and upload them to organisers’ blog/websites. Above is the picture of representatives from Sahabat Rakyat, Hindu Rights Action Force (HINDRAF) Johor and Parti Sosialis Malaysia (PSM) Nusajaya taken at the press conference held at South Johore Chinese Press Club. From left: Yong Siew Lee, Nyam Kee Han, S. Balakhrishnan, M. Kumaradevan、Silvarajah Erusam, Y. Mohan, Choo Shinn Chei, Cheng Lee Whee and Ang Pei Shan. 1. 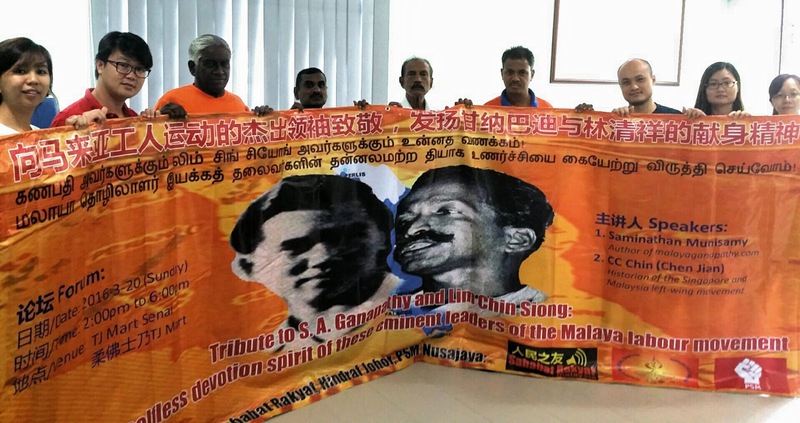 First media statement "Tribute to S. A. Ganapathy and Lim Chin Siong: Develop the selfless devotion spirit of these eminent leaders of the Malaya labour movement"